NEW YORK • Oil prices sank to their lowest levels in over a year, tumbling over 5 per cent in heavy trade due to fears of oversupply and falling demand, extending a sell-off that has taken major crude benchmarks down more than 30 per cent from an October peak. 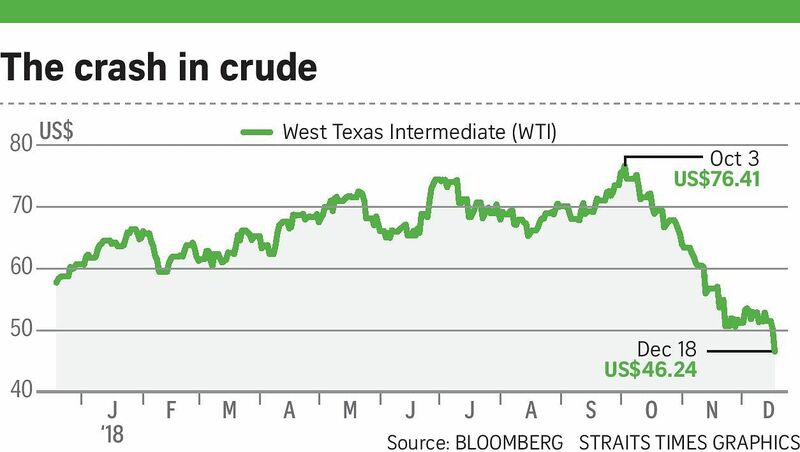 US crude oil slid US$3.64, or 7.3 per cent, on Tuesday, to settle at US$46.24 a barrel, the weakest since August last year, and almost 40 per cent off the roughly four-year highs reached at the start of October. In post-close trade, the contract was down 8 per cent to US$45.91 a barrel. US crude and global benchmark Brent both extended declines in post-settlement trade after trade group American Petroleum Institute (API) said US inventories unexpectedly rose in the latest week. US crude stocks rose by 3.5 million barrels in the week to Dec 14 to 441.3 million, API said, compared with analysts' expectations for a decrease of 2.4 million barrels. If that build-up is confirmed by US government data yesterday, it will be the first increase in three weeks. "There was a flood of supply-side news yesterday that, in combination with the demand destruction that the stock market slide implied, got us below US$50 (a barrel for US crude), and that gave us a strong sell signal," Mr Bob Yawger, director of futures with Mizuho in New York, said on Tuesday. The Fed was expected to raise interest rates yesterday amid a host of calls to pause its tightening cycle or risk harming the economy. Among the bearish factors, Britain's largest oilfield restarted production, increasing supply, the US government said output from shale would top eight million barrels per day (bpd) this year, and data suggested US crude inventories would rise this week. The Organisation of the Petroleum Exporting Countries and other oil producers agreed this month to curb output by 1.2 million bpd, equivalent to more than 1 per cent of global demand, in a bid to drain tanks and boost prices. But the cuts will not happen until next month and production has been at or near record highs in the United States, Russia and Saudi Arabia. Russian oil output hit a record 11.42 million bpd this month, an industry source told Reuters. Output from seven major US shale basins is expected by the year end to surpass eight million bpd for the first time, the US Energy Information Administration said.